Tragically, Thursday afternoon a 74-year-old motorist was killed at the Des Moines intersection of MLK and Clark Street after being struck by a red light runner. Red light runners cause hundreds of deaths and tens of thousands of injuries every year. According to the Insurance Institute of Highway Safety, in 2015 alone, 771 people were killed and over 100,000 people were injured at the hands of a red light runner. The most common type of car crashes not only include red light runners, but also drivers who do not obey stop signs and other traffic controls causing 39 percent of motor vehicle accidents where someone is injured. Over half of those killed in these fatal accidents are pedestrians, bicyclists and people in other vehicles. In a 2016 survey conducted by the AAA Foundation for Traffic Safety, 93 percent of drivers acknowledged that it is unacceptable to run a red light if it’s possible to stop safely, but 36 percent reported doing so in the past 30 days. Many drivers who run red lights or other traffic stops tend to by younger, more inexperienced drivers, who often have poor driving records when compared to other drivers. 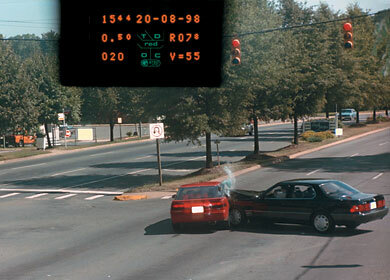 Red light runners were also more likely to be speeding or impaired at the time of the accident and less likely to hold a valid driver’s license. If you or a family member is injured in a red light runner car accident, it is important to seek the help of an experienced personal injury lawyer to obtain fair and just compensation for you injuries and losses. Contact the experienced Des Moines car accident injury lawyers of Stoltze & Stoltze PLC for immediate assistance today at 515-244-1473.